There have been some major changes in the smartphone landscape since my previous post about smartphone displays, so here is an updated graphic on the current state of consumer handheld screens. All ppi calculations were done using online tools such as this one. You might say I’m a bit overenthusiastic about technology and gadgets sometimes. When the joint Google-Samsung event which was scheduled for today was cancelled, it probably hit me harder than most people you know. I’ve had the day marked on my calendar, with reminders to follow multiple liveblogs, etc. All the same, the cancellation was understandable and it was a very classy display of respect for Steve jobs, who passed away last Wednesday, October 5th. The long-awaited Nexus Prime is rumoured to be unveiled at this Google-Samsung event. As a Nexus One owner—the original Google phone—I’ve been really looking forward to Google’s newest development. The Nexus line have generally set the standard that Google expects all its Android partners to rise up to. 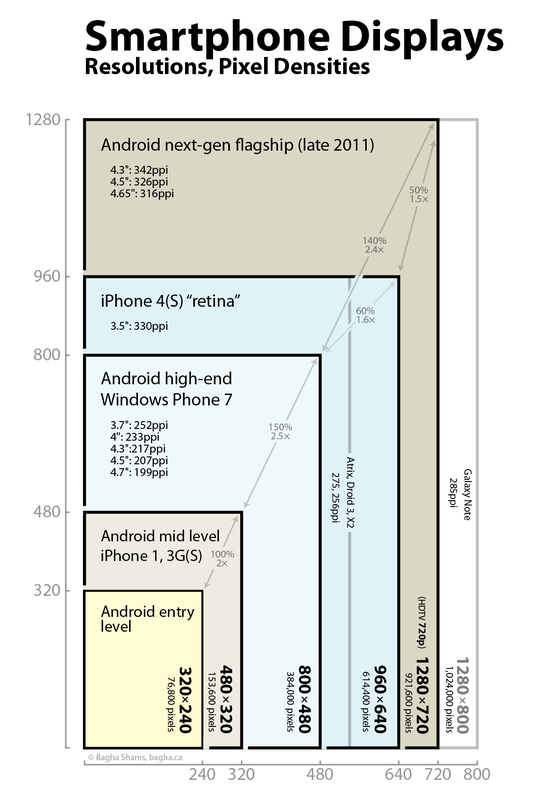 For example, prior to the Nexus One, few phones had a combination of a high-resolution display, fast 1Ghz processor, good camera, etc. (for the time). Now, it’s rumoured that the Nexus Prime (or Galaxy Nexus, or Droid Prime) will raise that bar again, and this time bring the screen resolution to an insane 720p HD (1280×720). The next generation of Android flagship phones are undoubtedly going to feature massive, pixel-dense displays like the Nexus Prime’s. These phones are going to be a joy to use—imagine having the screen resolution of most standard laptops in the palm of your hand. You could navigate websites in full, desktop mode, and you could even read the sharp text if you hold the phone close enough. To further illustrate the point, a 720p screen has 17% more pixels than the iPad. 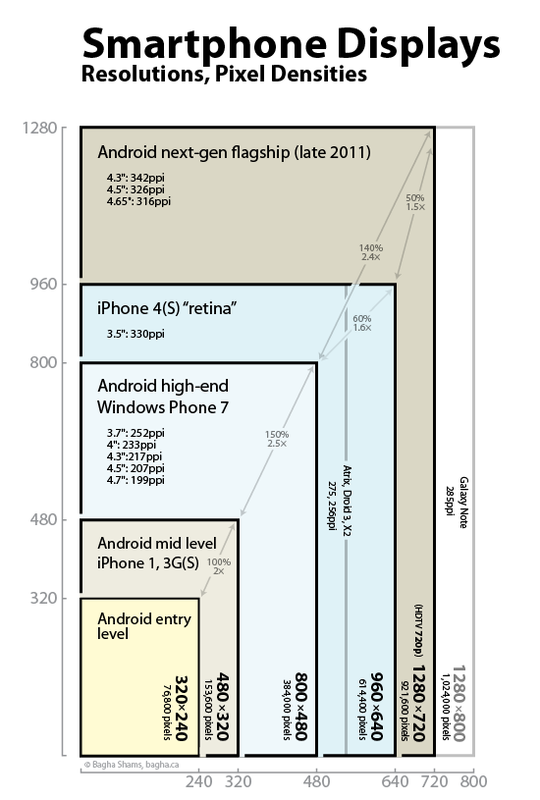 It’s crazy to think that my next phone is going to have 2.4× the resolution my current phone has. Such a large number of pixels requires a graphics chip that can drive them—which in turn requires considerable added (electrical) power, taking a toll on battery life. The Samsung Galaxy Note (which is gradually being released in various markets) has a gargantuan 5.3″ display which packs so many pixels, it’s like holding a current high-end Android phone in landscape, and stacking 2.6 screens above each other to make another portrait screen. This phone actually comes with a stylus (like PDA’s of yore), and is meant for pressure-sensitive sketching and note-taking, plus regular touch. It’s a great evolution of touchscreen technology. Platform makes an important difference as well. The HTC Titan is a new Windows Phone Mango device with a very large 4.7″ Super-LCD screen. Those of you who’ve been paying attention will remember that Windows Phone has a restriction on resolution: all devices must be 800×480—no more, no less. At this massive size, this respectable resolution would yeld a pixel density of 198.5ppi, which is about as detailed as current mid/entry-level phones on their smaller screens. 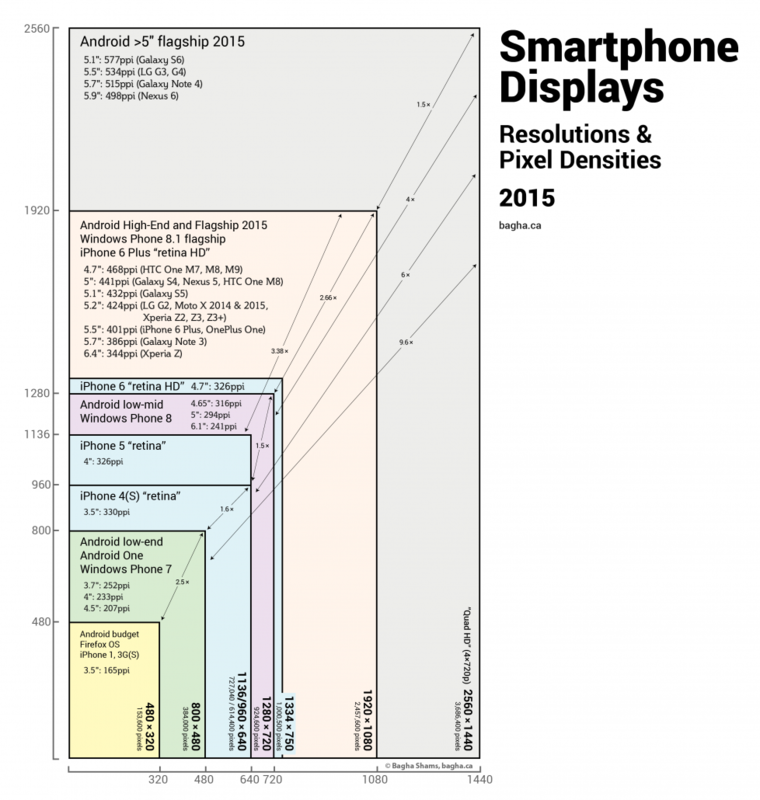 This next stage in display size and resolution is a great opportunity for Android to get ahead and stand out. 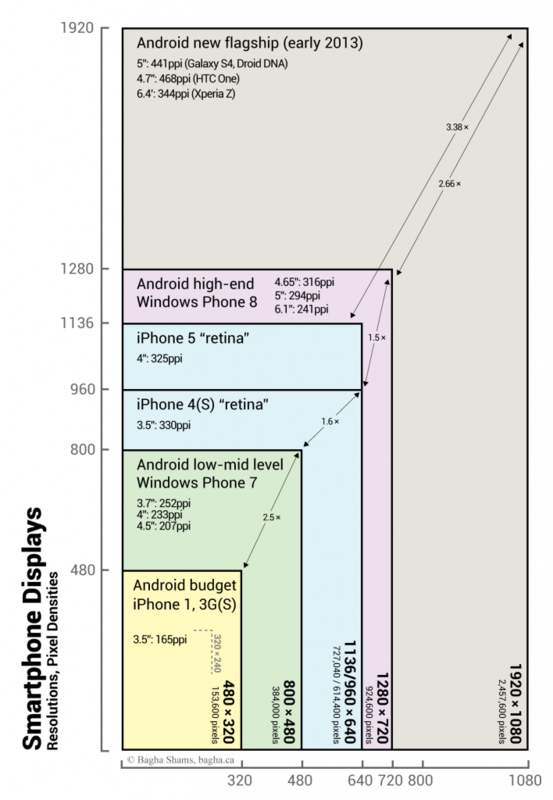 iPhone, with it’s “retina” display, will continue to be stuck with a relatively small 3.5 inch screen. You get a lot of fantastic things with Apple’s star product—such as a great camera, best-of-class apps, and unrivalled battery life—but you’ll never get a large screen on which to really enjoy the content you’re watching. Once consumers see the plethora of stunning large displays lining cellphone kiosks, they will undoubtedly look at Android devices with a new level of envy. Update: the Google-Samsung event has now been scheduled for October 19th in Hong Kong, at 10AM (In North America, October 18th, 10PM EST).